This book was very intriguing for me because it’s somewhat of a first: a science-fiction book based on a computer game. The computer game, by itself, was a major production: inspired by Steven Spielberg and produced by George Lucas’s company, LucasArts, it includes special effects by Industrial Light and Magic, dialogs by Orson Scott Card, and so forth. Alan Dean Foster is a good writer. He wrote books based on numerous movies, including Star Wars (as a ghostwriter for George Lucas), the Alien series, and many others. Writing a book based on a computer game should be nothing special for him. And indeed, the writing is fluent and enjoyable; the style is Foster’s typical script-based style, allowing you to easily recall the sights of the movie if you’ve seen it before, or imagine how they look like if you haven't. However, in this case, the result is a little awkward. Back inside the spire, he began to examine more closely the bulges in the walls and, in particular, various alien devices that rested inanimate in corners or clustered together on the bare floor. Some were enclosed in flowing transparent cocoons fashioned of material like spun sugar. These proved impervious to his touch. Glowing labels hovered above or in front of many displays like convocations of fireflies participating in some lampyriaecous military tattoo. They shifted and turned with him so that they were always visible no matter where he happened to be in the room. I don't know about you, but to me, this sounds like a plain description of the game’s user interface! There are other, more subtle cases that show all too painfully that the book is based on a computer game. Too much of the plot is based on an adventure-game like series of events -- an object is found, kept, and used. No object is found but never used. All objects have uses which are critical to the plot. And most of all, the feeling of a puzzle-after-puzzle, one small problem to solve after another, that is so typical to this kind of games. But what disappointed me most was the ending. Never since Snow-White and the Seven Dwarfs have I encountered such a mushy, sweet, happy-ever-after ending to a book! All along the plot, the reader realizes (too fast, in my opinion, but never mind that) what the problem of the Cocytans (the alien race) is. However, once the humans in the story realize that problem, it is solved within minutes -- after the Cocytans themselves have attempted to solve it for millennia. This is too easy, folks. A one-page solution to an age-old problem just doesn't cut it, let alone the fact that the solution is not convincing. And to top it all, to make the happy-end perfectly happy, even the dead are brought back to life... Really, this is overdoing it. I’m not sure this is Foster’s blame. The book is based on a story by Sean Clark, which probably wrote it with several other people from LucasArts. I’m not looking for anyone to blame, in fact. I just feel sorry at the loss of such an opportunity for a good science-fiction story. 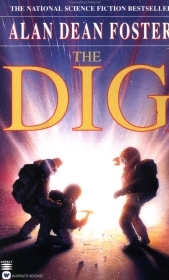 If you own a copy of The Dig, the computer game, you can play it (as well as many other old LucasArts games) on modern hardware, using ScummVM.